Vacation, wedding or business meeting - slideshows work! Smart wizards will help you create the perfect show. 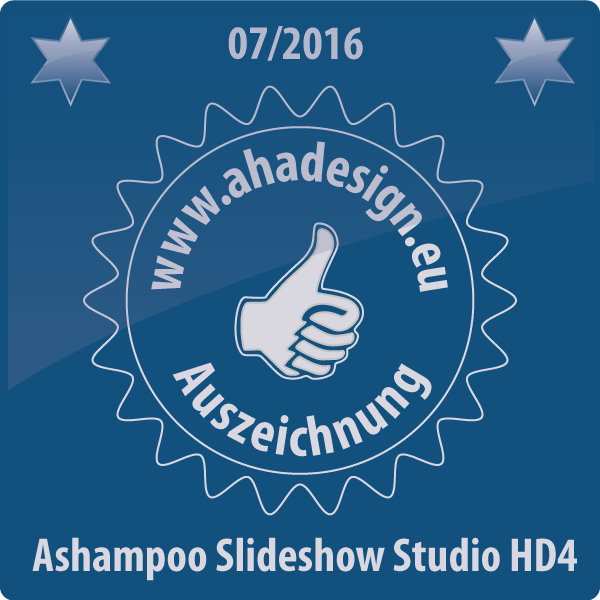 From duration to the number of images, Ashampoo Slideshow Studio 4 will provide useful recommendations and guide you through the creation process. To ensure that your show can be viewed on any device, we've included support for all common formats as well as burning your work on CD / DVD and Blu-ray disc. Slideshow Studio can turn any series of images into a masterpiece. Every step is logical and intuitive, you can create a movie in just a few clicks - if time is of the essence. But you can also take a more ambitious approach and select from the many creative tools to design your project with more love and care. Greater choice, more individuality yet highly easy to use! In the past, extensive slideshows could take some time to render, especially as high resolution outputs. By using modern technology such as NVENC (NVIDIA cards) and Intel Media, Slideshow Studio achieves great speed on any PC and long waiting times become a thing of the past! What makes a good slideshow? Slideshow Studio supports the highest resolutions including 4K for razor sharp images on high resolution displays. The new MKV and MP4 formats allow you to play your videos on virtually any device. To simplify matters even further, we've included ready-to-use presets for various devices (cellphones, gaming consoles, iPads etc.) to help you find the ideal movie format. Slideshow Studio comes with a lot of new templates, transitions and sound effects to add more life and vibrance to your slideshows. Additional templates are available as downloads, free of charge, of course. Add more life, humor and style to your movies! To help you find what you need quickly, we've categorized everything logically. Simply select your images and add music or provide your own voice narration. Everything is logical and straightforward. You may also use multiple audio tracks such as background music and spoken commentary. Overlays with informative texts, a custom logo or opening and closing credits - everything is just a few mouse clicks away. When you're done, burn your slideshow to disc or export it to a video file, it's that simple!